“Vocal Trio,” which consists of three musical instruments, transforms the voice of a singer or a speaker received through a mike into a sound of each musical instrument while maintaining the same rhythm and musical scale. A pipe horn, which looks like a long trumpet or pipe, makes a deep and low-tone horn sound. A water bell, which looks like a water drop, makes a clear bell-sound, and a leaf flute, which looks like a leaf, makes a reed pipe sound. The spectator’s voice is transformed into the sound of a musical instrument by means of a microcontroller chip. The microcontroller chip of each musical instrument makes a sampling of his or her voice’s frequency. A sampling of the voice made through frequency data is sent to midi chips, which transform it into the sound of a particular musical instrument and the sound is released through the speakers. EunJoo Shin is a media artist and researcher, living and working in Korea. She received BFA from Ewha Womens University in Korea. She continued to study Interior Architecture at the School of the Art Institute of Chicago and completed her master degree at School of Visual Art in New York. She has currently invested in her interests surrounding the “biological human.” Upon researching and simplifying biological mechanisms, she represents these mechanisms visually and audibly with software and hardware applications. The original capabilities of the biological and physical activities, such as talking, blinking, breathing, etc., are enhanced and exaggerated in her representations. 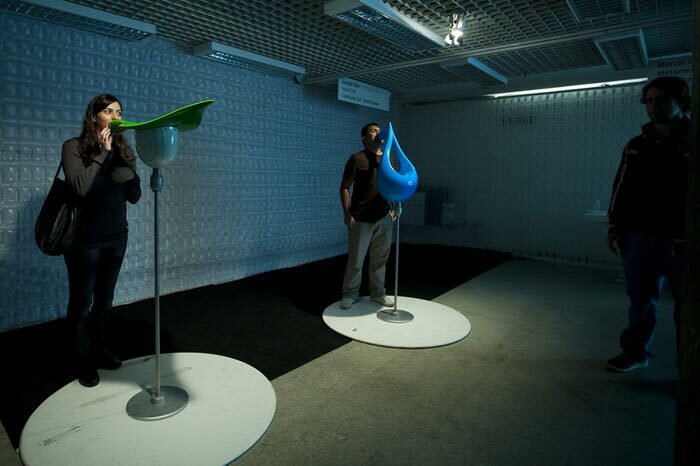 People can easily enjoy the interactive communication at the public installations of her works. Her artwork has been featured in many venues all over the world, including the IF Museum Inner Spaces in Poland, the 2007 World Knowledge Forum show in Seoul, 700IS Reindeerland Experimental Festival, the Seoul Arts Center, SIPA art fair, Redhead gallery (LMCC), NY. Her recent work, “Vocal Trio”, was selected as one of the best interactive designs in the annual design yearbook, CREATIO, which is published by the Korean Federation of Design Associations.